Yesterday (25th July 2011) we received a pretty big delivery. 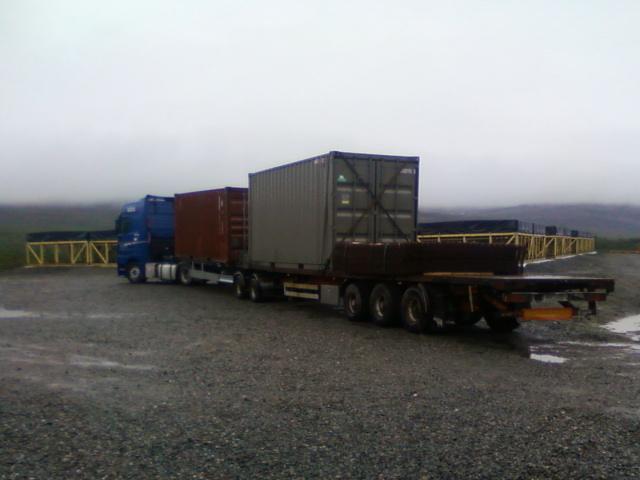 A road train arrived with two shipping containers and a couple of stacks of steel grids. The first container (brown) is the auxiliary container. 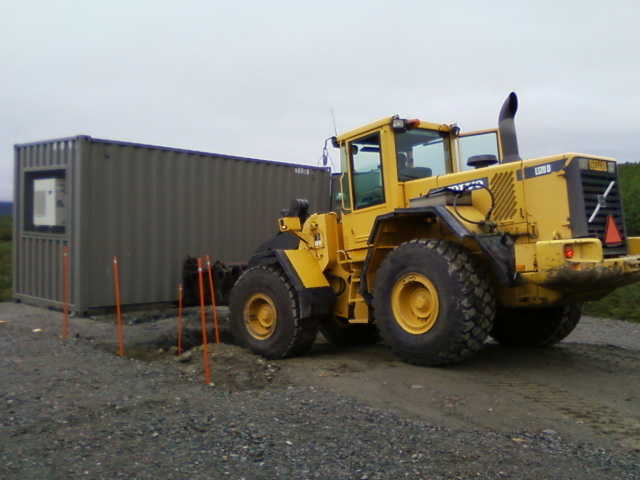 This will be used for additional storage capacity on the site (shipping containers are cheaper and easier to reposition than permanent structures). However, this was not the first to be unloaded and put in place. The second container (the grey one) is the RF-container. For those who have been following this web log (we admire your endurance! 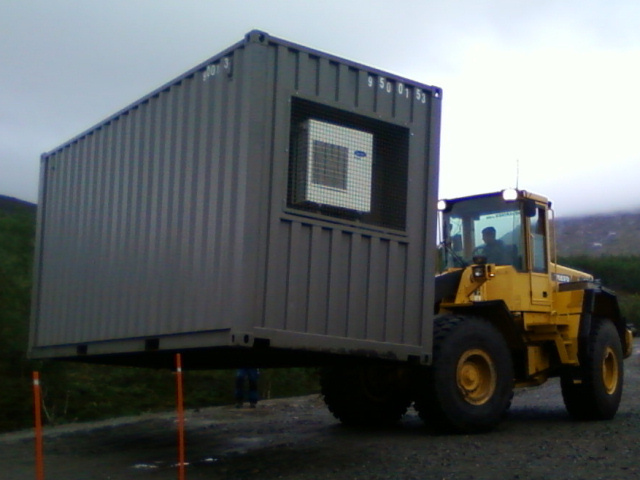 ), you will know that this shipping container is shielded against electrical noise and will house the bulk of the digital signal processing electronics. To get it from the delivery lorry to the northern corner of the array, we used the trusty 15-tonne digger. 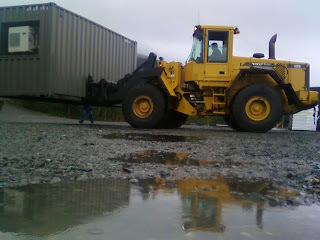 After a delicate moment trying to negotiate the forks into the container lifting slots we eventually managed it and drove it down to the array end through the rain. The final stretch was quite difficult. Apart from the turns and the slope, there was an open trench from the electrical power cabling. Although we had hoped to leave this open to make the post-installation work easier, we realised that this was not going to be possible, so the team rapidly filled in the trench while the digger waited with the 5-tonne container held precariously aloft. With the area ready, we hauled open the container doors (so we could feed in the cable ducting). Then it was time to move and lower the container onto the concrete foundation blocks. Getting this into position was not easy and we needed to to-and-fro multiple times to get the alignment just right. Credit is due to the digger driver who did an expert job of getting this just right. Once in place, the then attempted to extricate the digger forks. However, by this time, the angle of the digger and the weight shift of the container had jammed them in hard and any attempt to pull free was bringing the container along with it! After numerous frustrated attempts, Rauno Oikarainen hit upon the idea of knocking them out from the opposite side with lengths of timber and a sledge hammer. So, we disconnected the digger from the forks, backed it off, and then proceeded to successfully accomplish the task. 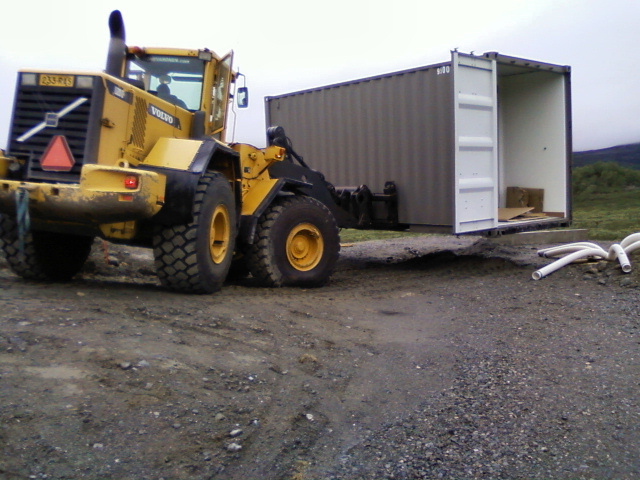 That was a difficult and time consuming process, but the container was now in place. More unloading to follow... in the next article!